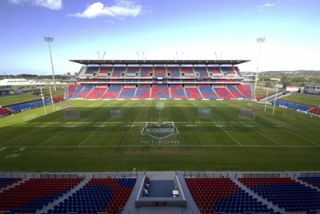 Ausgrid Stadium in Newcastle, Australia (formerly Energy Australia Stadium), home to the Newcastle Knights, has undergone redevelopment of its Western Grandstand. The stadium features a new audio system, designed and implemented by The PA People, using HARMAN’s JBL Application Engineered (AE) loudspeakers with weatherized treatment for external use (WRX) as well as JBL Control 29AV-1 and Control 25AV loudspeakers. All speakers are driven by Crown CTS amplifiers fitted with the latest Crown DSP card—Crown IQ PIPUSP4/CN. Overlay processing and control is via BSS London BLU systems. Loudspeakers for the stands consist of six clusters of spaced elements mounted close to the leading edge of the roof and a quantity of fill speakers to cover areas shadowed from the main clusters. Each of these six clusters utilizes a JBL AM5212 and AM4315 loudspeaker to cover the grandstand upper seating and one JBL AM4315 loudspeaker to cover the grandstand lower seating. Both loudspeaker models feature rotatable horns that allowed them to be installed horizontally. Careful selection of the horn coverage pattern and orientation allows the grandstand upper seating to be serviced by a single enclosure while maintaining SPL variation of within the target +/- 3dB. Servicing the grandstand upper seating with a single enclosure has the added advantage of virtually eliminating interference effects such as comb filtering which occurs when arraying loudspeakers to cover a common zone. The JBL AM4315 is operated as a passive 3-way and is driven from a dedicated channel of Crown CTS2000 amplification which also provides over 6 dB of headroom. The multi-band Progressive Transition mid-high frequency waveguide provides increased sensitivity in the critical midrange vocal region between 500 Hz and 2.8 kHz. The JBL AM4315 also has extended bandwidth and a well-controlled coverage pattern. Open arena viewing areas are covered by using the long-throw JBL PD5212/95-WRX weatherized loudspeaker. JBL Precision Directivity (PD) loudspeakers are regarded by professional sound operators for their pattern control down to 250 Hz.